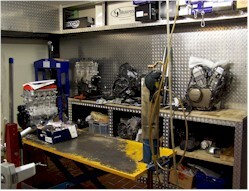 Several workshops for service, engines and racing can be found in our technical area. 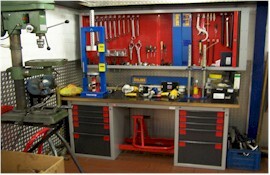 Specifically trained staff take care of motor-revision and –adjustment, chassis-adaption and service tasks in this area. - For more than 10 years we are ratad as " Oehins Technology Center"
Insight in our workshop area, where most oft he service work is done. Also smaller conversions that take less than a day,are realized in our service area. That’s where each motor treatment starts and ends. Central for injection changes and advance characteristics as well as fault diagnostics. hard- and software and additional features guarantee results at the highest level. 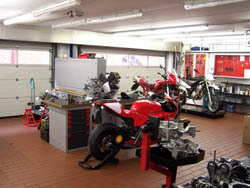 „Öhlins Technology and Service Center we are equipped with a huge variety of speciality tools, handling of different forks and buffers are possible. Whether Öhlins, Showa, Kayaba, Paioli, Marzocci, White-Power, Wilbers or Sachs we are able to serve you with any modifications and service tasks. A huge variety of measuring instruments is required to manage valve timing of different motor conceptions. A work spot in engine room No. 1 is perfectly equipped for these Highest cleanliness, clarity meet calibrated measuring instruments in here. One of two engine rooms is shown here. and the racing area is about to be expanded to 3 working benches. 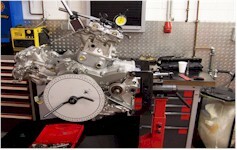 In workshop engine 1, extended to 50 squaremetrers, will be more capacity for engine treatment. Screw and milling machines as well as the part-cleaning area will have more available space.